Looking for eternal youth? Then this fresh and healthy apple sorbet, made with plenty of apples and relatively little sugar, might be just right for you! Apples are symbolically often connected with forbidden fruit, either with regard to knowledge or to carnal lust. But in old Nordic mythology, the apples were good things! 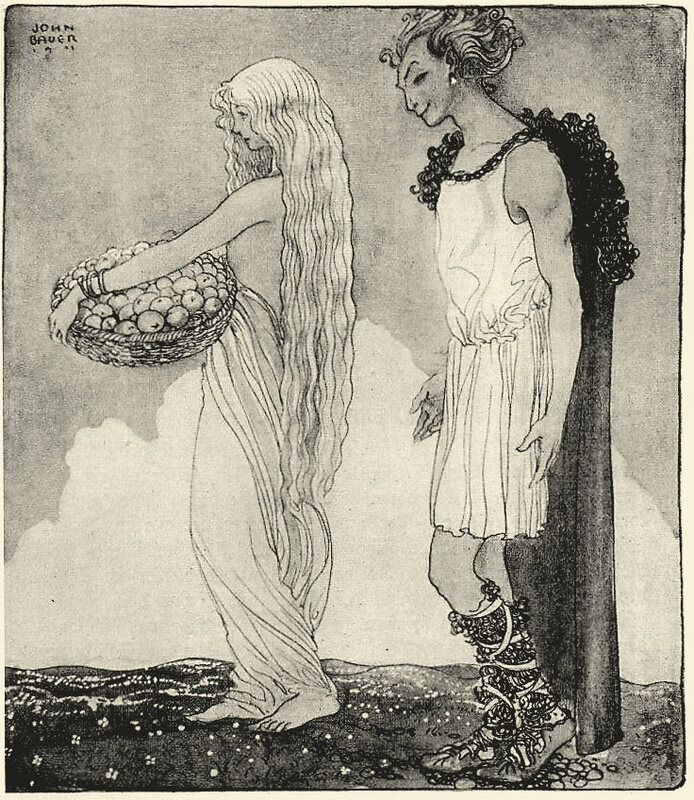 The Goddess Idun handled the Apples of Eternal Youth: the means by which all of the Gods kept their vitality. And vitality and health might perhaps be good arguments for promoting this somewhat different Green Apple sorbet. As you probably know, most sorbets are made with quite a lot of sugar syrup (water and sugar combined), and added flavour (such as fruit): rather straightforward and certainly the most common type of sorbet. But there is also another way – to prepare the sorbet with a lot of fruit, and a markedly small amount of sugar. Let us call this type the fresh fruity sorbet-type (not only characterised by its fresh fruit, but rather its low amount of sugar). For some reason, most of the recipes of this kind I have come across have been French, but calling it “particularly French” would probably be going too far. Some of these recipes even cut out any added sugar [except for the sugars of the fruits themselves], but unless we deal with bananas, I have never had any success with those: Cold dulls the flavours, and most fruit (save for bananas) are simply not sweet enough for frozen ice cream-type desserts on their own. The relative lack of sugar also creates problems with the consistency – Sugar syrup in a sorbet does not only provide sweetness, but also structure – too little, and the sorbet becomes icy and hard (too much, and it becomes too sweet and never freezes properly). And what if the fruits are more firm than juicy? Too little liquid in general will not only mean that the sorbet will freeze very hard, but also that the texture and the consistency will reflect this (think “icy, deep-frozen snowball”). Still, would it not be nice if a mostly-fruity sorbet would work out? Stepping up to the challenge, I set out to prepare a fresh fruity sorbet based on one of the more difficult fruits – apples! Apples are firm, which make them quite a tricky flavour for ice creams and sorbets. While one could press them in a juicer and only use the juice, what to do if you also want to include more of the actual fruit? Their firmness typically means that most recipes prescribe cooking down the apples first, in order to gain an apple purée or apple sauce, then to be added to the ice cream/sorbet base. These recipes can, of course, be extremely nice (see, for instance, this recipe for Cider and Apple sorbet!). 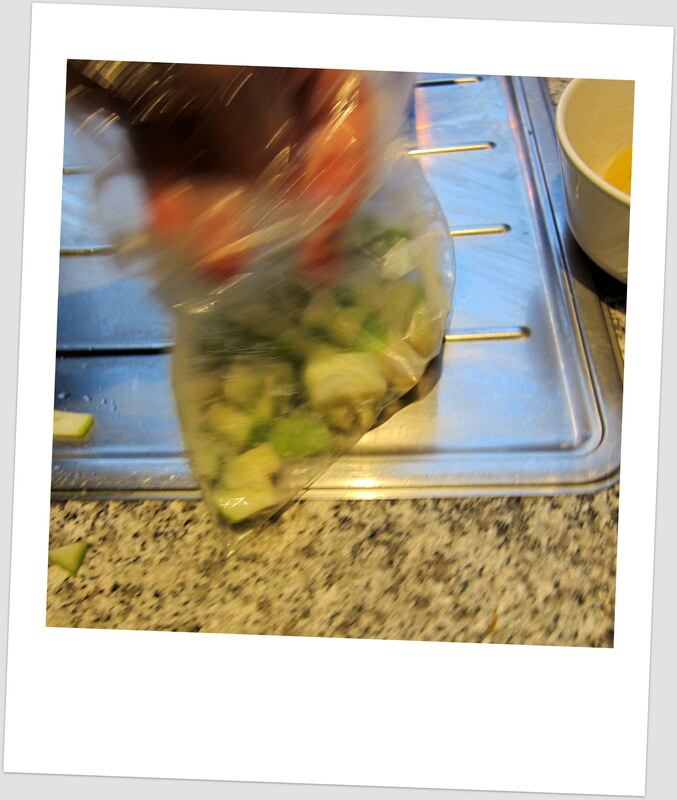 But if you are after the non-cooked, “genuinely fresh apple”-flavour, the cooking-methods won’t really help you much. Let’s find out if the fresh and fruity sorbet method might offer a way forward. First, take some nice green apples (like Granny Smith). Now, put the apple pieces single-layer into the freezer for a few hours to freeze. When the apple pieces have frozen, take them out and put them in a food processor/mixer. Churn them to a purée together with some simple sugar syrup, a little lemon juice and a couple of good pinches of freshly ground black pepper (!). Be careful not to overdose on the lemon juice – it is there to avoid a too sweet end-result, and should not overshadow or compete with the green apple flavour. 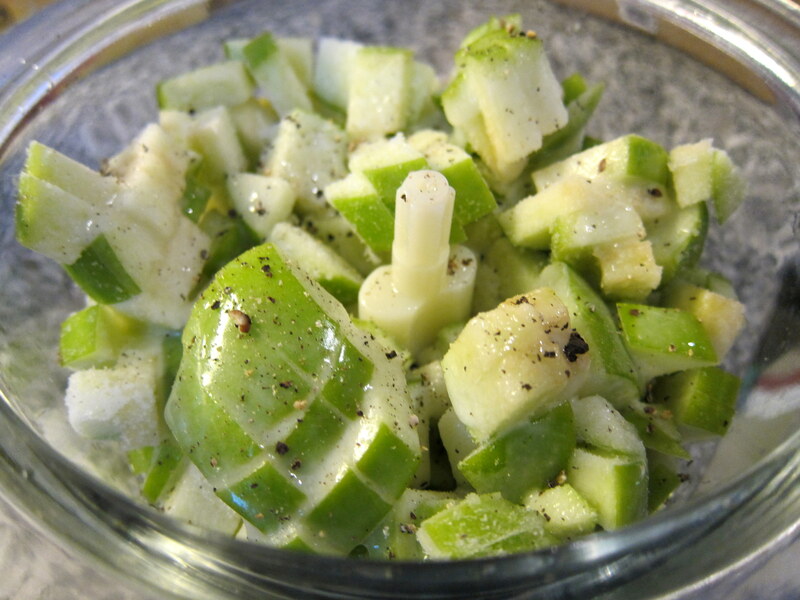 Who would have thought that green apples go so well together with black pepper? And no, you won’t really taste the pepper in the end. The churning at this stage will really dictate the final consistency and texture of the sorbet – and just so you know: because of the limited amount of sugar syrup, it will in all cases be extremely difficult to achieve a typically smooth sorbet texture (if you would prefer that, you should add more sugar syrup; read more about that option in the end) . Anyway, do what you can to grind down the structures of the apple pieces. Once your food processor/mixer has converted your mixture into apple purée, churn the sorbet base in your ice cream machine according to instructions. As mentioned, the sorbet will freeze quite quickly because of the limited amount of sugar. And once stored in the freezer, the sorbet will – unfortunately – freeze rather rock-hard. Clearly, this is a sorbet best enjoyed just after the preparation … otherwise, it will require ample time to de-freeze well before serving. The final result: Fresh and fruity sorbet ready to be enjoyed! 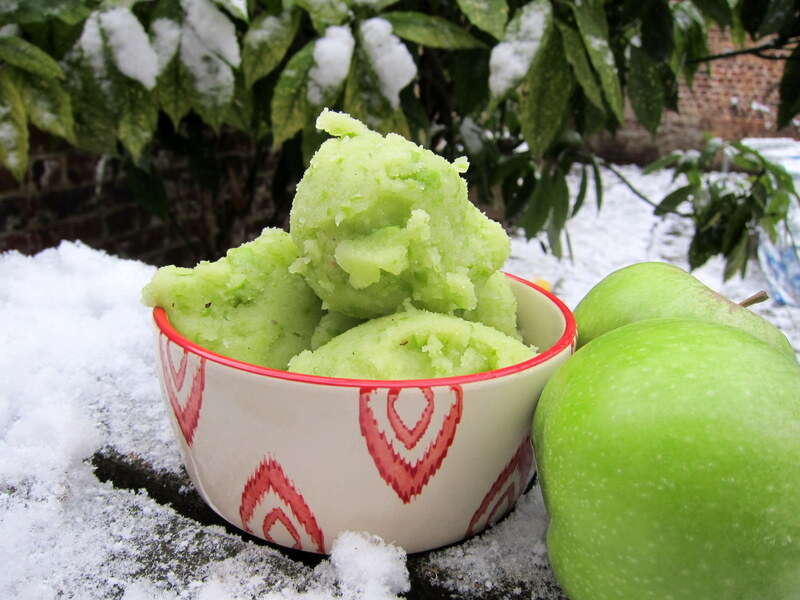 Green Apple sorbet – fresh and fruity style. Looks quite lovely, does it not? Traditional apple sorbets often require some kind of cooking of the apples, so for those in search of “true, unadulterated fruit flavour”, this recipe certainly provides a welcome alternative. The flavour of the green apples comes across with full force! Critics might perhaps hum about the Fresh and fruity sorbet-type being little more than “frozen fruit purée”. But since there are many varieties in the wondrous Garden of frozen desserts, let’s be more generous than so. 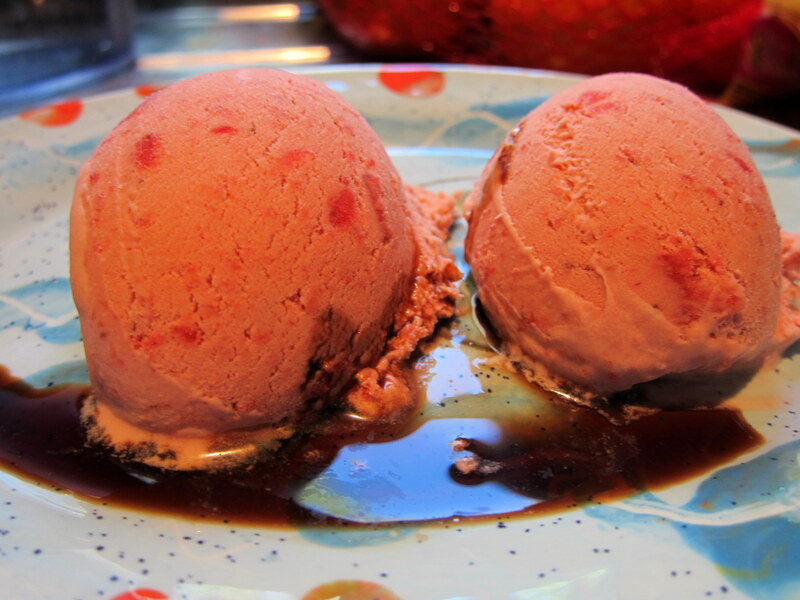 Perhaps this particular type of sorbet should be perceived as a kind of ‘rougher cousin’ to the standard sorbet. And while certainly coming across as a bit rougher in texture and mouth-feel, this cousin remains filled to the brim with the genuine and forceful flavour of the fresh fruits. With its limited amount of sugar and high proportion of fruit, the Fresh and fruity sorbet also scores high on a scale of (relative) healthiness. That said, it is clear that this type of sorbets also comes with disadvantages: it lacks the smoother, finer ‘typical sorbet texture’ and has a coarser mouth-feel. Because of the limited amount of sugar, it is also bound to freeze quite firmly in the freezer. Best to enjoy this sorbet relatively shortly after preparation, in other words. So – be healthy: grab some green apples, think about prolonged youthfulness and freeze some Fresh and fruity-style sorbet already today! 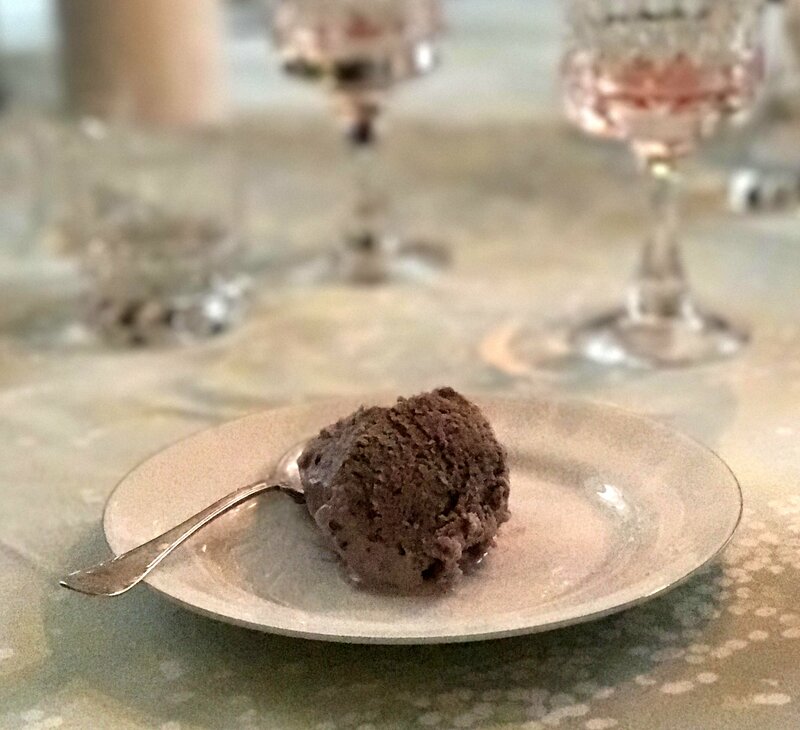 And by the way – in case you should feel that this sorbet deviates too much from what you yourself would consider to be “sorbet”, try combining a scope of it with any other, more ordinary ice cream. You will probably be very pleased with the result! 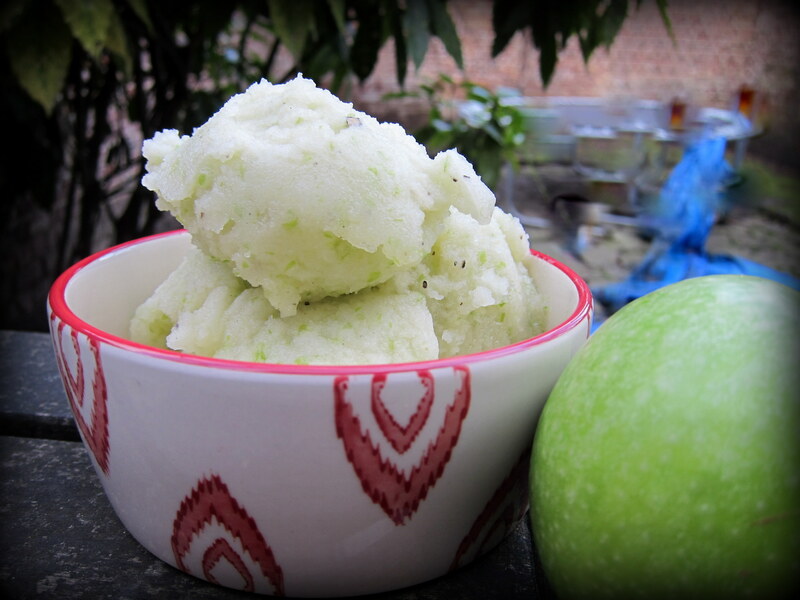 Green Apple Sorbet, this time made with more sugar syrup. The added sugar brings the sorbet closer to “traditional sorbet” in terms of smoothness and consistency. Notice also the shift in colour that follows from adding more sugar syrup. If you like the idea of using raw apples but prefer the consistency of more “typical” sorbet: try adding about 100-200 ml additional sugar syrup (and additional lemon juice of yet another lemon half) to the sorbet base. The increased sugar will make the sorbet somewhat less healthy, but the overall texture and consistency of the sorbet will be markedly smoother. Wash the apples, cut them in pieces and put them in the freezer. Once frozen, churn the apple pieces to a purée in a food processor/mixer together with the sugar syrup, the lemon juice and the black pepper. Churn in your ice cream machine according to instructions. Consume preferably right away or shortly after, since the sorbet unfortunately is bound to freeze very firmly (a consequence of the low amount of sugar used). For Red apple sorbet, just use red apples instead of green ones! In case you would like a more "traditional" sorbet, try adding about 100-200 ml (0.4--0.8 cup) additional sugar syrup and juice of yet another ½ lemon to the base. While the additional sugar will make the sorbet less healthy, the overall consistency and texture will be smoother and the sorbet will remain softer if stored in a freezer. Well done! Apple flavour is the most tricky one. I make “strudel” ice cream – which is exactly kind of puree in egg – custard base and in the last moment of churning I add raisins soaked in rhum and caramelized walnuts. It is smooth and creamy and nice but it lacks the sharp flavour of apple itself. I will give this a try..but alas, I don’t like the peels – but the sorbet won’t have such a colour without peels..
Hi! That sounds really good. A tip to prevent the sorbet from being too hard is to add a teaspoon or so of liquor, like vodka. Since it doesn’t have a flavor, all it would do is lower the freezing point so the sorbet isn’t so rock hard. Also, it’s not going to be so much that it imparts that alcohol flavor. Hi Karen, and thanks for posting! But indeed, a little added alcohol will help the sorbet stay softer. Increasing the overall sugar-content will accomplish the same thing (one could also replace some of the ‘standard’ sugar with inverted sugar, such as agave nectar, corn syrup, glucose syrup or honey). Though not caring all that much about the “healthy” aspect, I guess this is also a wonderful way of making a crisp, savory apple sorbet (maybe mixed with celery), e.g. as complement for fish. I was just wondering: Why do you need the initial freezing step? Couldn’t you just purée the (non-frozen) apples, then putting them into the ice cream machine? Hi Kai, and thanks for your comments. You’re probably right that the main thrust of the recipe also should work for a savoury sorbet. If you try it, do let me know how it works out! About the freezing of the apples: As you probably know, a cardinal rule of ice cream-making is that the shorter time it takes to freeze the (in this case) sorbet, the better it is. “Pre-freezing” the pieces of apples mainly serves this purpose, as the churning- time will be reduced (in addition, I would guess that the pre-freezing probably also makes the apples somewhat more ‘structurally fragile”‘ and thus easier to process). OK, I understand the reduced churning time, but since I never had any problems with the consistency of ice cream/sorbet made with only slightly chilled (or even room temperature) ingredients, the second part about probably being “structurally fragile” makes even more sense to me. My worry was that you might get ice crystals in the first freezing step, which you won’t get totally rid of in the food processor (well, having a Pacojet would be cool, not having to worry about ice crystals anymore); but maybe that’s just a theoretical, hypothetical problem. I guess that mixing the frozen apples thoroughly will defrost them enough. I used only a little bit of glucose syrup, and seasoned with salt, pepper and a tiny bit of Vodka. It tasted great together with a piece of fish. I’m not too sure about the skin – in this specific dish, a bit of texture in the sorbet was not bad, but generally I might enjoy a smoother texture more, putting up with the drawback you mentioned (slight loss of flavour, and naturally also of colour). On the other hand, I guess your food processor is better than mine, because my sorbet wasn’t as homogeneously green as yours. Well, I’ll continue browsing some more on your very nice web page, looking for further inspiration. I’m pretty impressed so far, and enjoy your style of writing. I have a glut of apples, mix of eaters and cookers, they are firm to bite but not crispy like Granny Smiths, can I still use these for your recipe? The final flavour will of course reflect the type(s) of apples you have used, but in principle, I think that your mix of eaters and cookers could work out nicely. I tried this recipe for New Years eve. Overall it was a success – the taste was as expected – fresh and very apple-y. Unfortunately my sorbet got very quickly brown and unappetizing, even though I added juice of 1,5 lemons (my apples were not sour enough). I had to use blended spinach to give my sorbet green color. I also didn’t use pepper, i think it would be a bit weird. Great idea to use spinach for colouring! As for the pepper, it might seem odd but it actually adds to the overall flavour in a very nice (and not really ‘peppery’) way. Very nice recipe. It’s interesting with the texture of the peel blended in. I used sour jersey mac red apples with the quantity of ingredients your recipe suggested and I can’t stop eating it! can one make this without an ice cream maker? You could try to still-freeze it in your ordinary kitchen freezer, but since that will take much longer time than in an ice cream maker, the result might be coarser and more icy than you would like, especially as there is so little added sugar in this recipe. You could try to use more sugar in the sugar syrup, and/or accept that the mix actually might be best straight out of the food processor/mixer (even if not as thoroughly frozen as a “real” sorbet). Best of luck!